The Turkish word Kariye is derived from the ancient Greek word Chora meaning outside of the city (land). It is known that there was a chapel outside of the city before the 5th century when the city walls were erected. The first Chora Church was rebuilt by Justinianus (527-565) in place of this chapel. In the era of Komnenoi, it served as the court chapel for important religious ceremonies, thanks to its nearness to the Palace of Blachernae. Chora Church (Chora Kirke) was destroyed during the Latin invasion (1204-1261) and repaired in the reign of Andronikos II (1282-1328) by the Treasury Minister of the palace, Theodore Metochites (1313). It was expanded towards north, an exonarthex was added to its western side and a chapel (Parecclesion) to its southern side, and it was decorated with mosaics and frescoes. 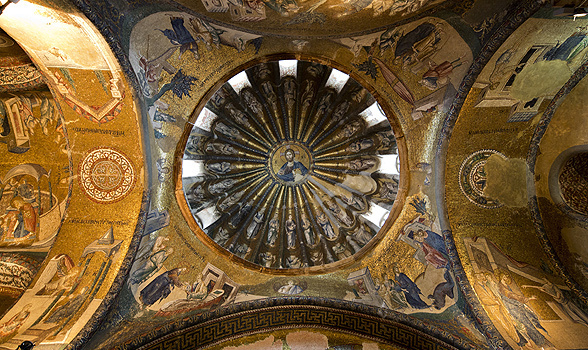 The mosaics and frescoes in the Chora are the most beautiful examples dating from the last period of the Byzantine painting (14th century). The characteristic stylistic elements in those mosaics and frescoes are the depth, the movements and plastic values of figures and the elongation of figures. After continuing to serve as a church following the conquest of Istanbul in 1453, the building was converted into a mosque in 1511 by Vizier Hadim Ali Pasha. It was converted into a museum in 1945, and during the restoration in 1948-1959 carried out by the Byzantine Institute of America, the mosaics and frescoes were uncovered and brought to the daylight.